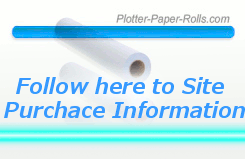 42 x 150 Plotter Paper – 2″ Core comes (20-lb) and (24-lb) heavier than the previous plotter cad paper rolls we have talked about and of course that is due to more paper width. You cannot use this paper on a plotter printer that has a CAD Paper width less than 42-inches. Yes, we have heard that question before….one guy wanted to cut the roll to make one he had in his office fit on the plotter printer…. hmmmm. Not recommended to do. This paper is designed for Wide-Format Inkjet CAD drawing, plotting. Engineered to be compatible with all wide format ink jet printers! 42 x 150 plotter paper fits all plotters which accept 24 inch wide format paper rolls up to 42-inches with 2-inch core, including most plotters from Canon, Calcomp, Encad, Epson, Hewlett Packard (HP), JDL, Kip, Oce, Roland, Xerox, and more! Recommended for HP Canon Epson and Inkjet Paper Plotters you can find this American Made plotter paper starting as low as $71.44 and you will be pleased with quality and fast service in getting the product.